Homemade spicy carrot hummus is one of my new favorite ways to spice up this classic chickpea spread. Smear it onto a toasted seeded multigrain bun and add all of your favorite crispy vegetables for an awesome take on a vegetarian sandwich. Begin by tossing the carrots and garlic with half the olive oil and sea salt and roasting them in a 425 F oven until tender - about 20 minutes - tossing carrots intermittently through cooking process. Once cooked through, set aside and let cool. Add cooked and cooled carrots, garlic cloves, tahini, 2 tbsp lemon juice, water, and spices to a food processor and pulse until smooth - if the hummus is too thick continue adding olive oil and/or water until smooth and flavorful. Stir in as much Sriracha as you can handle and season with salt and pepper. Use immediately or refrigerate. 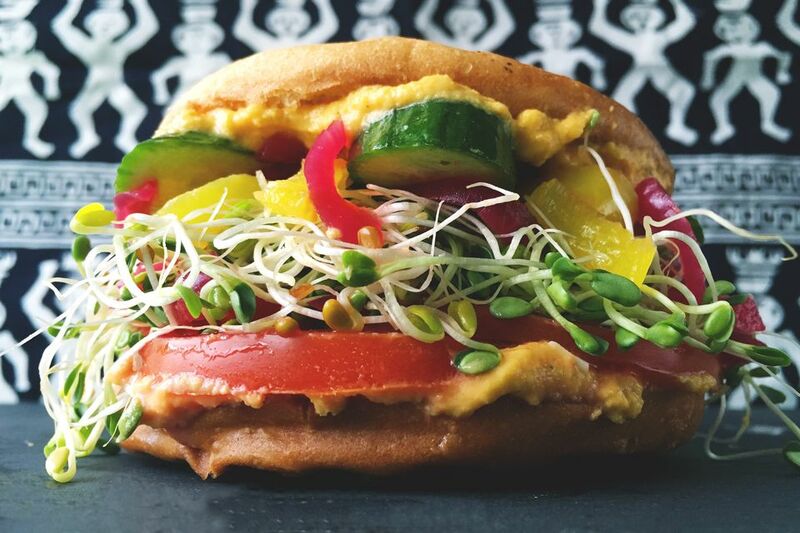 Toast your multigrain seeded bun and add a smear of the spicy carrot hummus to each side. Pile on tomato, sprouts, banana peppers, quick pickled red onions, and cucumbers. Take the other half of the toasted multigrain seeded bun and place it on top. Serve immediately.